Algebra is a very powerful branch of Mathematics. It provides solution to real-world problems. It helps in transforming word problems into mathematical expressions in form of equations using variables to denote unknown quantities or parameters and thus, providing numerous of techniques to solve these mathematical equations and hence, determining the answer to the problem. Representation of problem it the key step of finding the solution because, until we have carefully described the actual problem into mathematical statements and have correctly form the relationship between the variables and constants using various techniques to solve these equations will be a futile activity. As, if we made mistake in forming up the relationship in mathematical terms then the solution that will be obtained would be based on the equation you have used and thus, will be worthless and not true. So, this step is a very important and crucial step and in this blog, we will learn how to form the correct relationship using Linear Equations. A Linear equation is the one which contains either constant or a combination of constant and variable. A single variable linear equation is generally denoted as “ax + b = 0”, where a and b are constants and a ≠ 0. A linear equation can contain more than one variable, two variable linear equation is usually written as ‘ax + by + c = 0’ and in general n-variable linear equation is “a1x1 + a2x2 + …+ anxn = 0”, where a1, a2, …, an are constants. Here, linear doesn’t mean linear in variable but linear in the power of variable i.e. the power of x, y, … should be 1 and not more than that. Therefore, an equation such as x2 + 3 = 0 cannot be called as Linear Equation, it is Quadratic equation. We all have come across Linear equation in our high school and most of us find them terrifying, not solving them but forming these equations. The language of the word problem is at times tricky and we end up making mistakes and forming incorrect equations thus, leading to faulty solutions. And Trust me! In CAT the problem you will be getting very tricky problems and there would be multiple instance where you have to make use of linear equation to find the solution of the problem. So, to successfully apply linear equations, we first need to learn to aptly translate the word problem into them. The following steps with the help of an example will guide you about how to form Linear Equations. Read the problem carefully and read it again. Yes, read the problem several times until you clearly comprehend with it. Also reading multiple times will help you uncover all the significant points and will make sure you won’t overlook some important piece of information. Identify key phrases and organize the information by assigning variables (in form of letters) to the unknown quantities. Translate the problem into algebraic equation using the phrases and variables that models the problem. Solve the equations using methods such as elimination, matrix etc. Last step is to check the answer you have obtained both mathematically and intuitively. The sum of digits of two-digit number is 7. When the digits are reversed, the number is increased by 27. Find the numbers. Let’s read the question several times and note down all the key points and translate them into mathematical equations. I know it’s an easy one but still you should read it at least twice. Now let’s check once are we getting the right answer if x = 2 and y = 5 then the original no. would be 25 and if reversed the new no. would be 52 and yes, their difference is 27. So, our answer is correct. Since, Linear equations has wide range of application such as problem on ages, numbers, time, speed and distance problems, Time-work problems, Functions, Arithmetic Progression etc. In fact, it can be used anywhere where a relationship is defined for some unknown value and our aim is evaluate those parameters we can make use of it. But, today in this blog, we will be focused on only one type of problems i.e. the word problems based on age. These problems are very confusing and the language is a bit complex and we end up usually making up errors in the formulation of the equation. So, I’ll discuss and try various different type of questions on this concept that will give you a thorough understanding of how to form Linear equations and solve them. 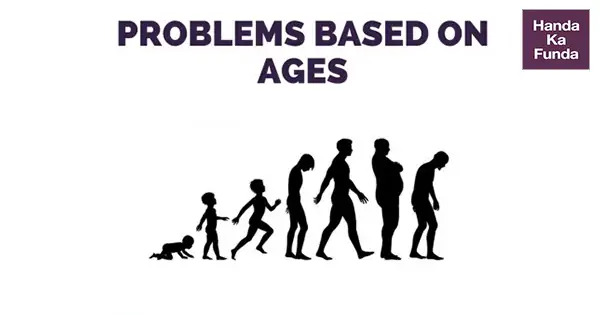 Now, Problem on ages can be categorized into three types, i.e. Questions based on calculating the present age, Questions to determine the age of person after k years and questions that calculate age of a person before k years. These three types may cover cases of various types with different combination of ratios, fractions etc. If ages are given in form of ratio P: Q then, then P: Q would be Px and Qx respectively. Numerical: Sneh’s age is 1/6th of her father age. Sneh’s father age will be twice of Vimal age after 10 years. If Vimal’s 8th birthday was celebrated 2 years ago. Then what is the present age of Sneh? Substituting z = 10 in 2 equation we can easily get the age of Sneh’s father to be 30 and then we can calculate present age of Sneh. Thus, the present ages cannot be determined with the given information. Solving the first equation, we get age of Farah = 36 years. Hence her daughter’s present age is 6 years but we need her age 3 years back. So, she would have been 3 years old. Numerical: The present age of Amit and his father are in the ratio 2:5. Four year hence the ratio of their ages becomes 5:11 respectively. What is the father’s age five years ago? Age of Amit and his father is 16 and 40 resp. Therefore, five years ago Amit’s father age = 40 – 5 = 35 years. Numerical: The sum of present ages of father and son is 8 years more than the present age of the mother. The mother is 22 years older than the son. What will be the age of father after 4 years? Solution: Again, there are 3 people in this question. Thus, three variables. Let present age of father, son and mother be x, y and z resp. Since, the sum of the present ages of father and son is 8 years more than the mother i.e. x + y = 8 + z. Therefore, y + 4 = 34 years. Numerical: The ages of A and B are in the ratio 6:5 and the sum of their ages is 44 years. What will be the ratio of their ages after 8 years? But, we need to find the ratio of their ages 8 years from now. Thus, their present ages are 24 and 20 respectively. Case 3: Combination of age after k years and before k years. Numerical: The ratio between the present ages of A and B is 5:3. The ratio between A’s age 4 years ago and B’s age 4 years hence is 1:1. What is the between A’s age 4 years hence and B’s age 4 years ago? I hope, your concept would have been cleared and you now evolve better understanding about it and will be able to solve questions on your own. The above given combinations are just few types, there could many like that, you will get better hold of it if you practice them.